Hello everyone, my name is Sandra, and I will be taking over here at Shared Appetite. The door was open so I just decided to let myself in and look around a bit. Can you believe the nerve of this guy Chris, who eats at every amazing place New York has to offer? And he gives you every mouth-watering detail about each perfectly prepared dish as you sit reading with your bowl of lifeless cold cereal each morning. Who does he think he is? Well, I’ve had enough and it’s time to give this overly blue site a bit of a woman’s touch. So did I have you for a second there? My husband tells me I am a terrible liar. “So what are you doing here,” you might ask? You should also be asking the same of Chris, who at this very moment has taken over my blog, Kitchen Apparel. It is actually quite common for bloggers to do guest posts for each other. However, we are super cool bloggers, and being such we decided it was time to start a new take-over trend. While I share a recipe with you here on Shared Appetite, Chris will be doing the same over at Kitchen Apparel. So if you are missing him already, just follow the links and see what he is up to. I’ll be checking in on him later to make sure he’s not making a mess in my kitchen! I seriously love Chris’s blog Shared Appetite, and if you are a regular follower you will probably notice me gushing over his awesome photography and amazing restaurant reviews. Since Chris is such a trendy guy who gets to eat at so many spectacular restaurants, I had to up my game with a crazy trendy recipe. 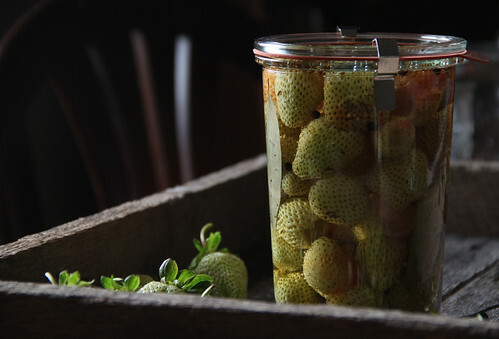 A few weeks ago I read an article about how unripe green strawberries are a growing trend in upscale restaurants. They basically pick the strawberries before they fully ripen and while they are still acidic, tart and firm. They are steadily growing in popularity, and can be found paired alongside seafood such as scallops, or pickled and added to seasonal dishes. 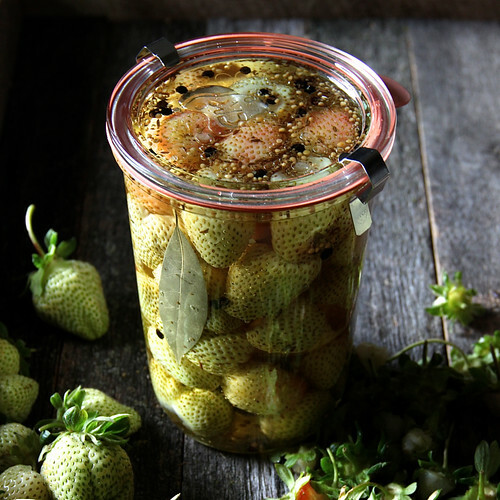 After reading this article I knew I had to get my hands on some green strawberries and try my hand at pickling them. 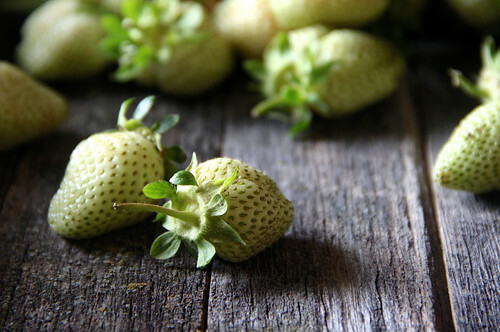 The best ways to find green strawberries is either a lucky shot at a farmers market or pick your own. Fortunately for me there is a farm close to where I live that offers pick-your-own strawberries. I talked with the family that owns the farm and asked if I could pick a few at the very start of the season while there were still plenty of unripe berries around. 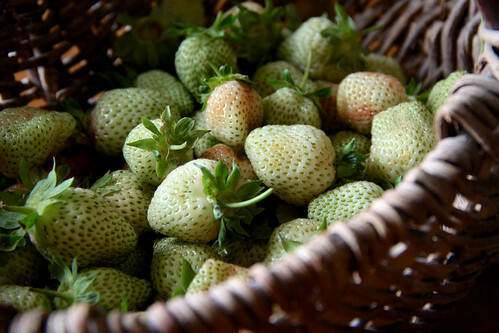 You want to pick the strawberries that are slightly ripening, a bit soft and are mostly green (they will be almost white-green). Definitely stay away from the very hard and bright green strawberries. I will also warn you that when you check out with your green strawberries you are going to get some interesting looks. But armed with the new knowledge that green strawberries are a growing trend, you will look smart and trendy yourself (Unless you are Christopher Cockren and have only just gotten out to pick strawberries this last weekend – Can you hear the extreme disappointment in my voice Chris? However, I guess it could be worse though, you could be hiding sheep under the table). Clean and dry a jar big enough to hold all the strawberries. 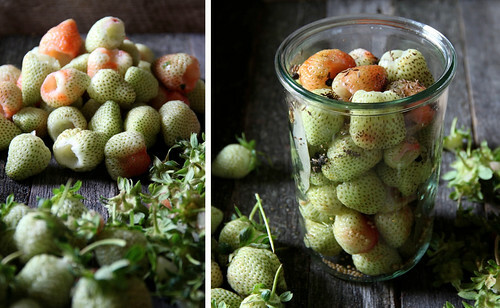 Fill the jar with the washed and hulled green strawberries, packing them tightly together. 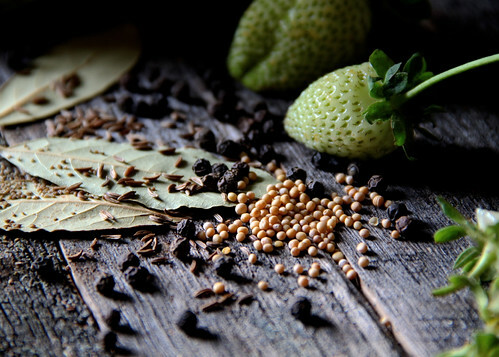 Add the black peppercorns, bay leaves, celery seeds, caraway seeds, yellow mustard seeds and red pepper flakes (if using) over the top of the strawberries. Set the jar aside while you prepare the brine. In a saucepan over low heat add the vinegars, water, honey and sea salt. Gently simmer until the honey and salt has dissolved. Set the mixture aside until it has cooled completely. Pour the mixture over the green strawberries (if it doesn’t completely cover the strawberries you will need to make more brine). Cover the jar and give it a few gentle shakes to move all the spices around a bit. Refrigerate the green strawberries for at least a few days before using. NOTE: Normally you would add the brine while it was still hot, but for this recipe you want it to cool down so the strawberries don’t become mushy and chewy. Isn’t that awesome Carey! It blew my mind too when I first read about it. The farm that I picked the strawberries from was also really intrigued and baffled at the same time…they had never heard of such a thing either.